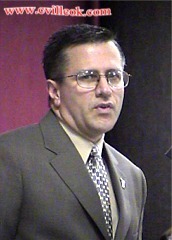 Larry Shafer took the reins of the Collinsville Chamber of Commerce as President for 2004. 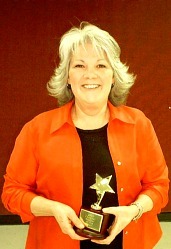 Linda Pavey was honored as the 2003 Chamber Member of the Year. Lori Fullbright of KOTV News Channel 6 was the guest speaker at the Chamber's Installation Banquet Saturday, January 17, 2004, at the CHS Commons. Lori covers the crime beat and said Collinsville should feel good that she did not travel to here in 2003 as she is normally following "bad" news. Lori entertained the crowd with samples of her experiences ranging from interviewing Presidents to being categorized as a "manure spreader" by a humble farmer. 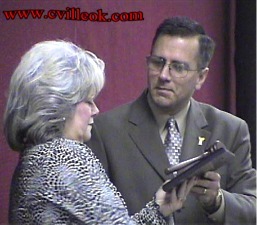 Marilyn Hardacre (2003 President) accepts a gift from 2004 Chamber President, Larry Shafer. 2004 Collinsville Chamber of Commerce officers are sworn in by Phil Ostrander, Master of Ceremonies for the evening. Don Hutchinson, Marilyn Hardacre, Robin Bell and Larry Shafer will guide the chamber this year with lots of other helpers.